Jun. 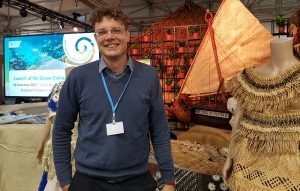 Prof. Dr. Janpeter Schilling attended the UN World Climate Conference (COP23) in Bonn. In the interview with R&C he shares his impressions and assesses the progress made at the conference. 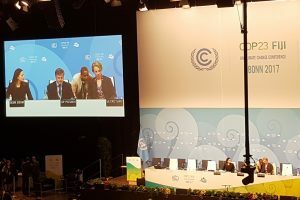 R&C: Which speech at the COP23 did you find particularly impressive? The statements of some heads of small island states have especially impressed me. These “urgency statements”, which are intended to push the negotiating parties to act, are a common feature of climate negotiations. However, it does touch one when Tuvalu’s president Ratu Epeli Nailatikau comments with reference to the threat of sea level rise; “it keeps me awake at night, every night”. In the next breath, he sent a message to the United States: “The climate change deniers must go home”. At the same meeting, Roosevelt Skerrit, prime minister of the island nation of Dominica stressed the devastation brought by Hurricane Maria. “My country was brought to its knees overnight”, he stated. Representatives of other island states asked the question “what if you have nothing to adapt to?” These statements stick in your memory. R&C: What was the atmosphere like at the conference? The atmosphere was mostly constructive to positive. Important progress was made. There were only signs of resignation from some government officials in Caribbean and Pacific island states which are particularly struggling with storms and sea-level rise. Especially on the last day of the conference, the calm and partly tense atmosphere in the main conference building was lightened by a quartet from Fiji who got a lot of applause for their singing and guitar tunes. R&C: How do you assess the overall success of the conference? The COP23 certainly did not fail. The main cornerstones of the much debated “rule book” that defines how the national emission targets are checked and reported, have been fixed. In addition, 18 states led by Canada and the UK have joined forces to create an “anti-coal alliance“ that aims to phase out coal worldwide by 2050. R&C: Only sweet talk or climate champion – what role did Germany play? Chancellor Merkel called the fight against climate change a “vital question” for the world during her visit at the COP and numerous government representatives from other countries praised Germany’s constructive role. However, Germany did not live up to its image of a “climate champion”. Germany is likely to miss its 2020-climate target which sets a reduction of CO₂ emissions by 40 percent compared to the 1990 level. This is mainly due to Germany’s continued reliance on coal for energy production. Germany is not part of the anti-coal alliance, at least not yet. Phasing out of coal will be key for Germany to achieve its ambitious climate targets. Note: An earlier version of the interview in German can be found here. Janpeter Schilling holds a Klaus Töpfer Junior Professorship for Landuse Conflicts at the University of Koblenz-Landau in Germany. He is also associated with the peacebuilding organization International Alert in London and the research group Climate Change and Security at the University of Hamburg. Furthermore, he is a member of the editorial board of the R&C blog.